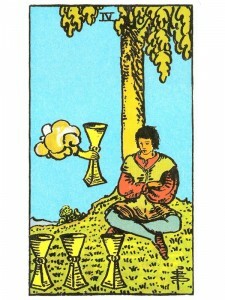 Four of Cups – If you wish to experience emotional fulfillment – re-evaluate things. You have become bored – you are in need of motivation. You are not making any effort because you have become dissatisfied with your achievements and the things of this world. Allow things take their natural course – trust in God to create the necessary changes and allow this situation to be, so that it can regenerate. Rest and meditate and you can receive insights and messages from your unconscious. You are seeking a spiritual level of satisfaction. You feel weary and disgusted with your present circumstances. Your intuition has been halted by your lack of focus or sense of purpose and this indulgence in your emotions has led you to dissatisfaction and exhaustion. Go slowly now in any emotional matters – your apathy has resulted from a dull, non-stimulated environment. You are bored only because your curiosity has not been piqued and your project has become meaningless to you. Anger is great energy, use it productively. Use your frustration to help you move forward – convert your anger into progressive energy and use it to understand what you fear. Take this time to be with nature – observe its natural rhythms and you will be rejuvenated. Remain open to the new opportunities that life is offering you now – they will lead to happiness and satisfaction. Centered, you are serene in the knowledge of your emotional blessings. An emotional/creative plateau that will serve as your foundation. Emotional stability and confidence. Healthy acceptance and love of “self”. Primary relationships are under control and supportive of your desires and needs. You know the love you need will always be there. You manage your talents well. Friendliness, faithfulness, loyalty and trustworthiness – trust and respect. Peace of heart. Next to Wheel of Fortune: A new interest will be presented now – you should become involved, it will eliminate your present dilemma. Next to Hanged Man: You are feeling sorry for yourself – get over it. No one likes miserable company – make some effort. Next to Hermit: You are enjoying spiritual refreshment – a gentle peace and satisfaction surround you. In the first position: Your Karmic Contract is to establish and nourish a stable foundation for your relationships and creative enterprises. In the second position: Your self-appreciation anchors you in the sea of material life, much as a buoy in a busy harbor. You always know who and where you are. The stability of your emotional life allows you all the energy and attention you need for physical/material affairs. In the third position: Time for emotional confidence. Believe in the love that is yours for the having. Your foundation is in place if you will but center yourself upon it and use it. Trust in your own abilities as they are already developed, as well as their potential. Rest assured of the loyalty of those on whom you depend. In the fourth position: You want emotional security, the backup of energy from successful relationships and proven talents. Does a white house with a white picket fence come to mind? You like being liked. In the fifth position: You are taking charge of your personal affairs and talents, for you are confident now and plan to take advantage of the moment. Your emotional confidence is reinforcing and charging your confidence in mental affairs. In the sixth position: The restless serenity of the Buddha under the Bodhi tree comes in your near future. Your emotional stability is a foundation and a foundation is to build upon. What do you do with this foundation once it is yours? How will it transform your relationships and your creative enterprise? In the seventh position: As the restless serenity of the Buddha under the Bodhi tree symbolized a test for the heart, so does it as well for the mind. With peace of heart the mind can leap forward towards its goals without emotional distraction. In the eighth position: The physical plane is infused with the positive energy of your emotional well-being, helping you seize your brass rings. There is mutual support/respect in your inner circle. In the ninth position: Your heart is aware of your disarming effect on those nearest you, of the fact that people simply like you and love you. There is a healthy awareness that there is more for the having, for you and for your loved ones through you. Your heart feels the positive characteristics of this archetype of emotional security. In the tenth position: Sit under a tree – root yourself to the ground and look to the sky. Stiffen your backbone and allow the sword of Gabriel to fill you with light even as you rest before raising your emotional house. Your emotional foundation, the gate of stability through which you must pass in order to mingle and mix safely and successfully with many more of your brethren is yours within this next year. You site is helping me tremendously in building my tarot practice. I am having issues understanding the 4 of cups in a reading I did for myself. I did a 3 card spread asking if my relationship will recover from a big negative issue we are currently experiencing and if we will be married as planned. I got 6 of cups in first positions, 4 of cups in 2nd position, and 2 of cups in third position. I take this as mostly positive, but the 4 of cups keeps throwing me off. I am thinking I should be looking for something negative, but I take it as our current state of reflection and re-evaluation.